​It's been 14 years since the first installment of Ice Cube's hilariously funny tale of the day to day antics of a typical urban barbershop. Barbershop has always been filled with laughter, quirky one-liners and the ridiculosuly funny man Cedric The Entertainer. The third and in my opinion the BEST Barbershop debuts this Friday and is a must see anyone in need of a laugh with a powerful message behind it. I attended the Vegas "Barbershop The Next Cut" with my 11 year old last night and departed the theater with such a feeling of pride. The film produced by Malcolm D. Lee reminded us all of the issues facing the black community sans the Hollywood filter and rhetoric. The Next Cut gracefully captured the authentic feelings that many mother's and fathers of color are faced with daily. 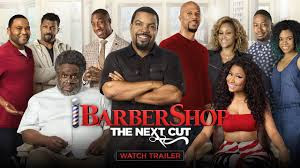 With an emphasis on community and family The Next Cut features a dynamic cast of franchise favorites Ice Cube, Cedric The Entertainer, Eve, Sean Patrick Thomas and Troy Garity. Anthony Anderson, Regina Hall, Common, Nicki Minaj, JB Smoove and Lamorne Morris leave us all longing for an afternoon in the South Side's favorite barbershop. Make plans to see Barbershop The Next Cut... You'll Thank Me Later!